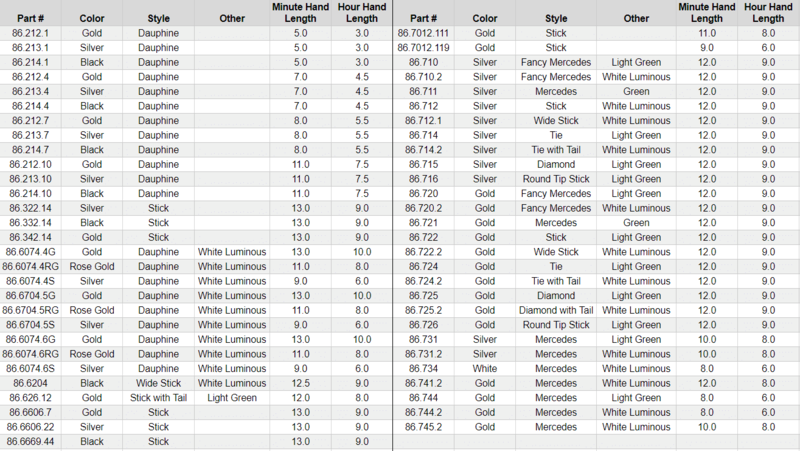 The hands listed here are made to fit the hole size minute hand .70mm and hour hand 1.20mm. This is the most popular hand size used on many of today's movements including Miyota, Harley Ronda, Seiko and many more. They are available in different lengths, styles and colors. The longer hand is the minute hand and is put on after the hour hand, the shorter hand is the hour hand and is put on before the minute hand. All the hands are sold in pairs. The lengths listed are measured from the center of the hole to the tip of the hand using the minute hand which is the longer hand in the pair. All the hands are sold in pairs.